Sigma finally adds weather sealing to an Art Series lens! For the longest time, it has been a bit of a pain for photographers wanting that unicorn-esq combination of fast aperture and ultrawide field of view. 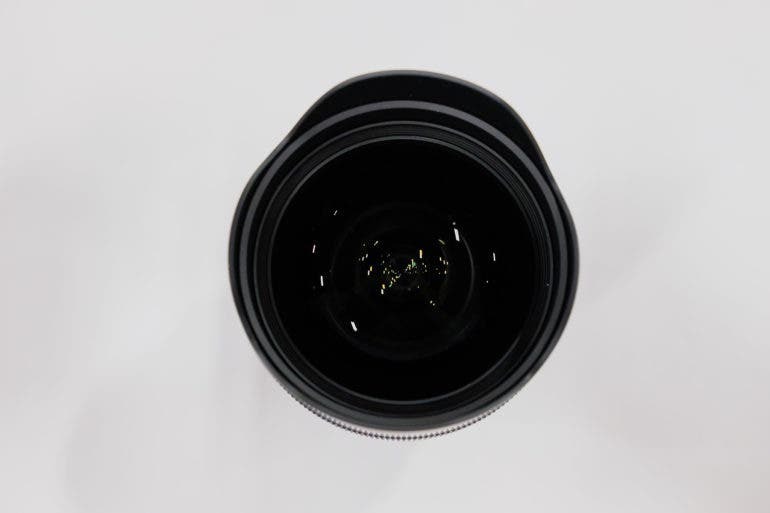 Their only real options were in the form of extremely expensive lenses from Canon or Nikon, or third party options that offered questionable image quality, build quality, or had some sort of usability issues that made them not ideal choices. 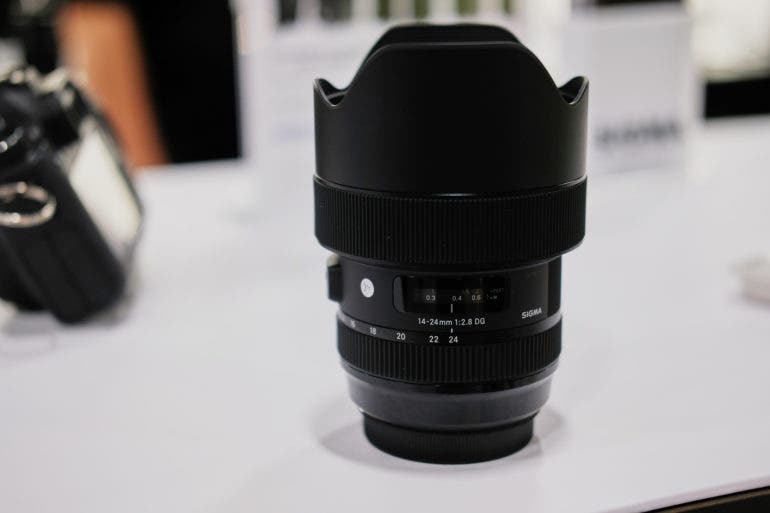 Well, as Sigma has been known to do, they want to blow that dynamic up, and they are doing so in a big way with their new 14-24mm F2.8 Art. This is a lens that offers that now legendary Sigma Art lens aesthetic that combines excellent image quality with great build quality in an affordable package. But Sigma has also upped the ante with this lens, adding weather sealing on par with their Sports designated lenses making this lens an excellent choice for those looking to shoot outdoors in less than ideal conditions. These specs were taken directly from the Sigma website and their mini-page for the 14-24mm F2.8 Art. In terms of its ergonomics, the Sigma 14-24mm F2.8 Art looks very similar to its other Art series brothers and sisters. It has an enormous (as you should expect for an ultrawide) front element with a build in leaf petal lens hood. This means that filters with this lens will be a bit of a pain, but as a consolation, Sigma will be offering hood-replacements (at a cost, of course) which will remove the petal hood in favor of a more filter friendly option. 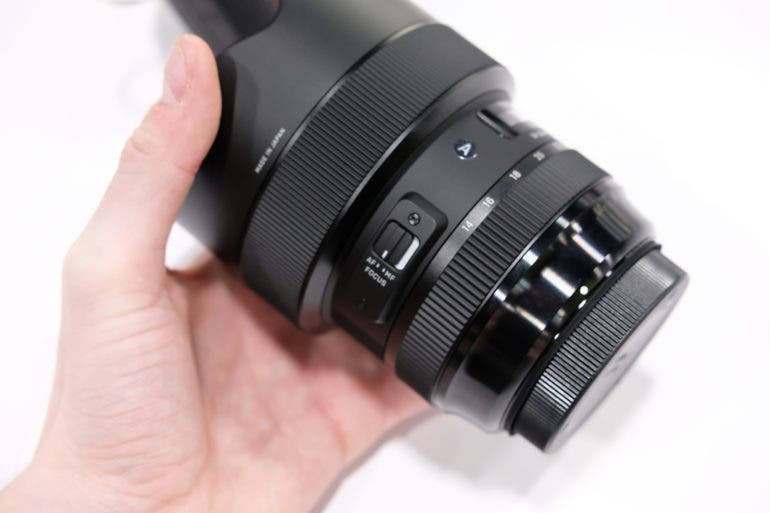 Just below the built-in hood, you will find the focusing ring for this lens, which looks and functions just as you would expect if you have ever used a Sigma Art lens in the past. 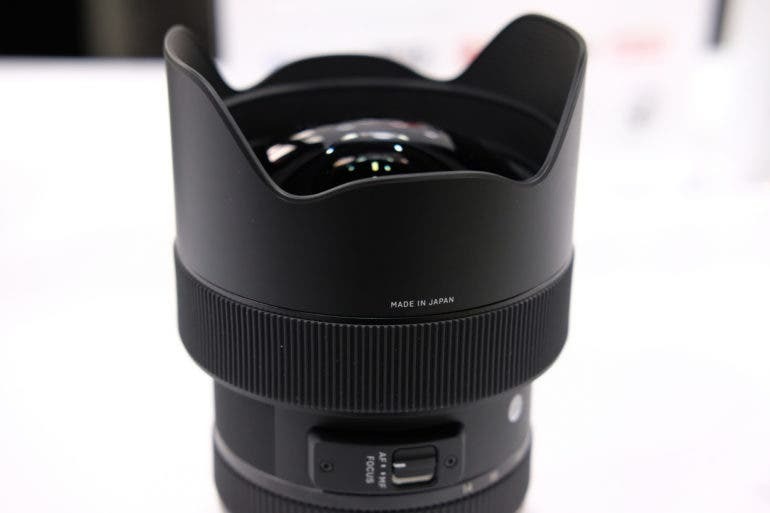 In our time with the lens, it felt a little tighter than a normal Art lens, but the Sigma rep said this was likely a combination of the unit we were holding being brand new and also partially due to the added weather sealing on this lens when compared to the other Art series lenses. Following the focusing ring, you will find the distance scale, as well as the AF/MF switch. This switch was solid and clicky. It felt good and didn’t have any issues with being accidentally switched. It has that standard Art series lens look with the hand painted button that honestly impresses us every time we see one. Finally, rounding out the ergonomic tour, at the base of the lens you will find the zoom ring. 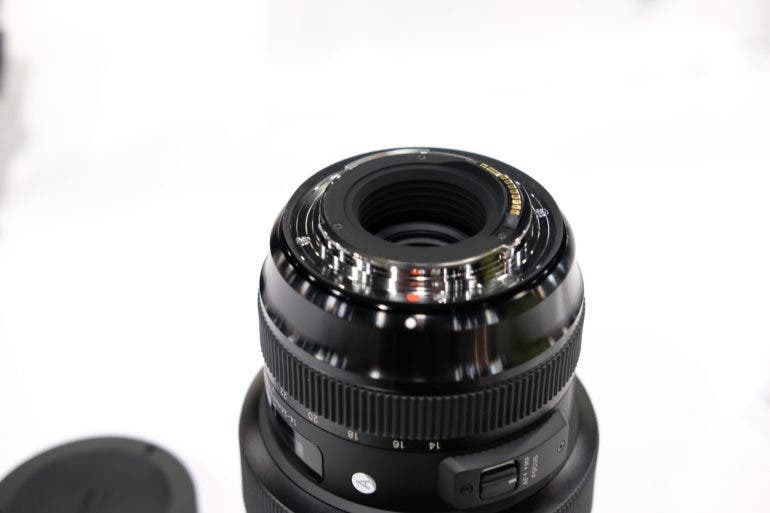 Similarly to the focusing ring, it looks and functions like other zoom rings in Sigma’s lineup, though it may be a tad tighter, for the same weather sealing reasons as noted about the focusing ring. The mount of the lens is classic Sigma, though with the addition of a visible rubber gasket to help with the weather sealing and keeping unwanted moisture and dust from entering through the mount. 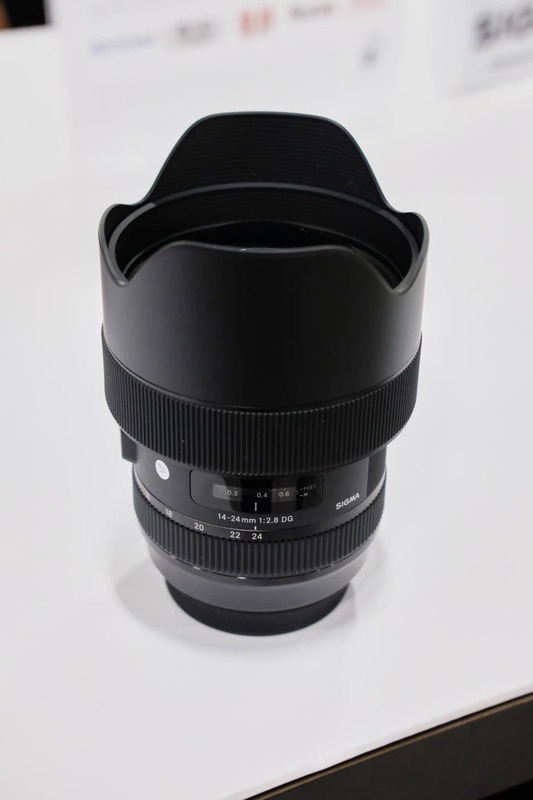 Overall, the lens is exactly what we have come to expect from Sigma in terms of ergonomics in their Art Series for years now. We have no complaints at this point. The Sigma 14-24mm F2.8 Art feels like a brick of glass, which let’s be honest, is an incredibly common trait of Sigma’s Art Series lenses. You can hold this lens on its own and it feels incredibly substantial, but when balanced with a professional level DSLR it should balance fairly well if maybe a tad front heavy. As we have come to expect, this Art Series lens exemplifies the best characteristics of build quality with solid glass elements, rugged metal construction, and a metal mount. The addition of weather sealing to this 14-24mm F2.8 Art removed one of the biggest remaining complaints professionals had about the Sigma Art Series – the lack of weather sealing. And so this lens can be trusted out in the wild and in unideal conditions when paired with a weather sealed body – finally. Overall, we really have no complaints about the build quality of this lens; our only note would be that stiff focus and zoom rings shouldn’t be a by-product of weather sealing. Canon and Nikon and other brands have made these for years with their weather sealed lenses without having stiff focusing and zoom rings; so that is not a valid excuse for this. That said, lenses often come initially with stiffer focusing and zoom rings that become easier to turn as the lenses are used and ‘broken in’. So we will have to wait and see if these lenses break-in to our satisfaction or if they remain somewhat stiff throughout their lifespan. 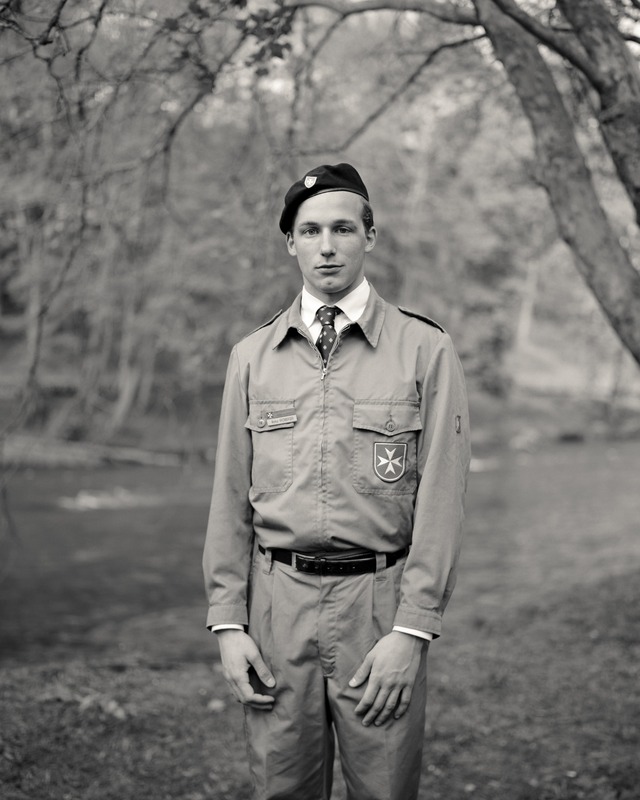 We were not given the opportunity to put the lens on a camera and shoot any images with it. However, we are expecting a review unit soon and you can be sure that our review will have you covered on that front with plenty of sample images. The 14-24mm F2.8 Art is positioned well to be an incredibly popular lens from Sigma. It’s combination of excellent build quality, weather sealing, and almost distortion-free image quality makes it an ideal choice for landscape, architecture, and anything else where a fast ultra-wide lens could be helpful. Plus, add to the fact that it is incredibly affordable when compared to the OEM options from Canon and Nikon, and this looks like a real winner from Sigma. We will be putting the lens through the full paces in our review, so stay tuned for our thoughts after some more extended time using this lens. But if our initial experience is any indication, Sigma has done good yet again.